Duarte of Santa Barbara has restored and collected outdated dialysis machines for a museum ( a" Museum of Hope"). These outdated machines were used in earlier stages of kidney dialysis. Most people have two kidneys and these organs provide life saving functions. Most important are the removal of excess water from the body and the regulation of internal chemistry. Additionally, kidneys remove waste from the blood, regulates blood pressure and control red blood cell production. If the kidneys either progressively malfunction or cease to function at all, a chemical or fluid imbalance occurs and the individual must receive help from an artificial kidney machine. This procedure is known as hemodialysis (dialysis means the removal of excess toxins and hemo means blood). The seventeen pieces of equipment in Duarte's museum have been preserved to illustrate how far along medical achievements with artifitial kidneys have come, where the kidney program stands today and where it is going. The purpose of the museum is to restore the equipment as a testimonial to the patients who have had to use them and to honor our current patient population awaiting the next viable treatment (form). As time and money has permitted Duarte has exhibited his "Museum of Hope" at Regional and National Kidney Conferences. 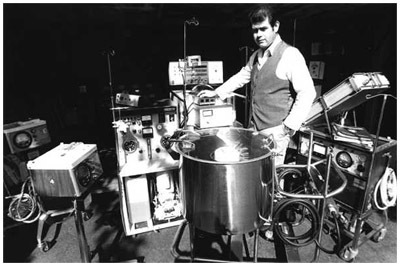 Some of the equipment, made between 1956 and 1970, was donated by dialysis centers at the Univerisity of California at Los Angeles and Irvine, and Santa Barbara Cottage Hospital. Others were recovered by Duarte and his corps of volunteers shortly before the machines were to be hauled off by sanitation trucks. His Museum includes a 100 liter pump tank, one of the first dialysis machines marketed on a larger scale - though pleased with this acquisition - Duarte continues searching yet for one other 100 liter pump tank to augment the collection. If you are aware of any old dialysis machines no longer in use, please contact Ray Duarte.